Morning has broken....OK, no Blackbirds speaking here in the desert, just Curved-billed Thrashers. But many of you might think that the desert is also devoid of seasonal changes. Far from that, we actually have at least 5 seasons: winters with freezes and sometimes snow, springs with or without wildflowers, hot, dry, pre-monsoon summers, then distinctly different hot, wet monsoon months with a second, rich, growing season, followed by sunny, pleasant autumn months that can last until after the winter holidays. This is when I harvest most of my garden vegetables like bell peppers, tomatoes and lattice. And while we don't have any trees that drop their leaves in autumn (they do it in April instead when it gets really hot and dry) autumn is one of the two seasons when wolfdog Laika and coydog Frodo blow their coats. You think raking leaves is frustrating work? Try to keep control of fluffs of soft white and black fur floating on our perpetual breeze or clinging to cloths and car seats due to the static electricity build-up that accompanies the dry season. So we work hard to keep the flurry at a minimum. At sunrise, we walk into the desert adjacent to our land carrying brushes and a double-sided shedding blade. The dogs get ecstatic when they see the preparations. In the wide open cactus free space of a dry wash Randy first tackles Laika. She loves it and tries to wiggle in closer to get her favorite spots scratched only to be replaced by another dog who can't wait his turn, so we end up using leashes to keep some order. Big clumps of soft hair soon dot the sand, but the wind quickly distributes them. Square miles of Thrasher and Cactus Wren nests will be well cushioned and insulated for another year. Hummingbird nests may look a little like snowballs. Some hair gets caught with the other flotsam in the washes and turns into precious organic humus that is in such short supply in the desert (I use some of it in my compost bin, too). Of course, the old summer coats of our wolf and coyote 'hybrids' only make room for much more luxurious winter coats, even here in Arizona. Desert-born. Frodo is an exclusive out-door (coy)dog. Laika enjoys her evenings inside with us, but around midnight she regularly asks to leave the house to spend the rest of the night under the stars. So they will make good use of their new thick, warm undercoats and they will be ready for another extensive round of shedding next spring. 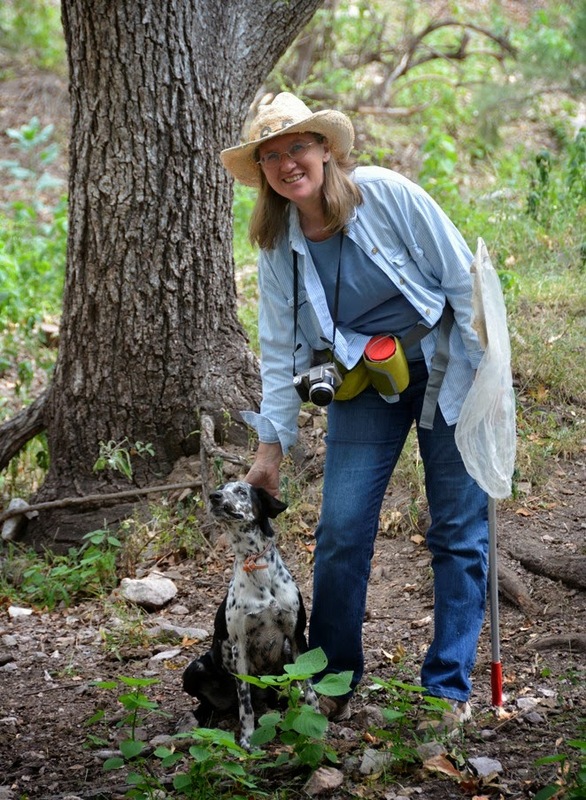 On October 18th, I took our dogs for a walk along Santa Cruz River Path that begins behind the library in Cortaro, Arizona. 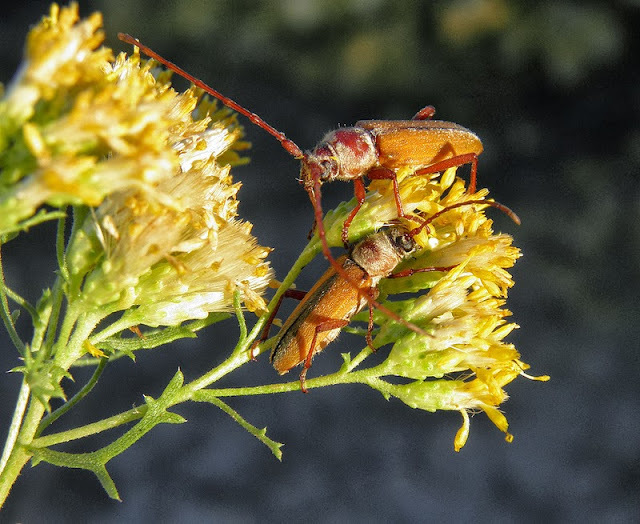 At this time in autumn now even in Arizona the activity of insects and other arthropods is decreasing, mostly because it is getting really dry after this year's less than productive monsoon. But there are still several late blooming species of asteraceae that reliably attract their own communities of bugs. Native to the Sonoran Desert, Isocoma tenuisecta, Burroweed, grows in dry, sunny, open, disturbed areas like roadsides, graded areas, and in overgrazed pastures and rangeland. I look for it in rural Marana where it can steal irrigation water from the cotton fields or live of run-off from roads. Two Cerambycid species can regularly be found: Sphaenothecus bivittata visits all late-blooming flowers and I always believed that this lively beetle with those extremely long antennae was just noshing pollen and nectar. But at a Patagonia art show my customers brought some to my booth that had been caught in flagranti: chewing holes into rose petals. I checked the literature: Among the known larval hosts are actually mesquite trees and - rose bushes. Surprisingly, the much larger and stockier Crossidius suturalis is much more closely tied to the Burroweed. The little perennial is not only the meeting place for the adults who find their mates here, but the plants in the genus Isocoma are also the only known larval host for the species. This year Crossidius seemed rare around Tucson. It is possible that the small host plants are more affected by the drought than mesquite trees and roses. Epicauta wheeleri and Epicauta sp. As it got warmer numerous butterflies descended on the burroweed. The Pygmy Blues find their larval host close by: Salt Bush planted along the river path by the Pima County gardeners who are doing a great job at using native shrubs for landscaping. American Snout Butterflies were extremely abundant last fall - they must have migrated up from Mexico by the thousands. Not too many this year. Lots of introduced Honey Bees dominated the flowers while local Sweat Bee species showed up in much smaller numbers. Lordotus sp. (?) and Poecilanthrax sp. Where there are bees, there are usually also the brood-parasitic beeflies. On my Burroweed patch, they were represented by several species, not all shown here. Of course, there were also predators: One of the beeflies fell prey to a lurking assassin bug. A little Prowling Spider was hiding in its retreat until I investigated it too closely for her taste. Conotelus mexicanus and Ripiphoris sp. Both of the above photos show beetles: The black pegs that look more like seeds or may remind of rove beetles are actually Sap-loving beetles, Nitidulids. See the clubbed antennae? The insect on the right is a female Wedge-shaped Beetle (Ripiphoridae) who does her best to look just like the bees that she intends to employ as foster parents for her brood. 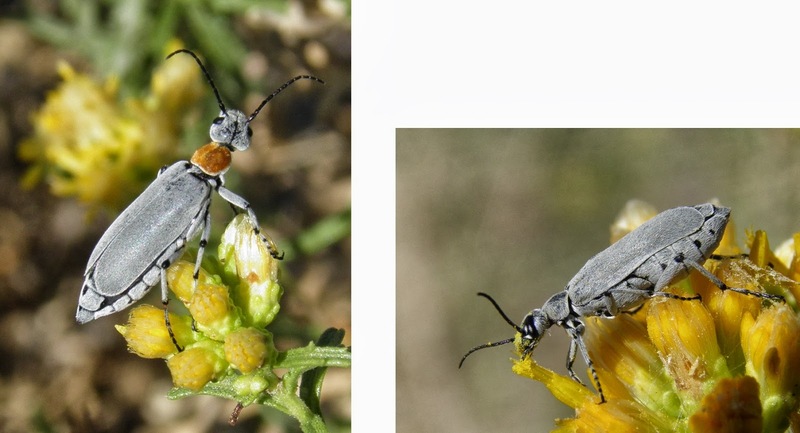 This species appears regularly in autumn on burroweed and is distinctly smaller than Ripiphorus vierecki that flies in April to lay its eggs on Desert Marigolds along this same River Path. If you are interested in the natural history of this group click here. The Santa Cruz River Path in Cortaro is lined by new developments, sport fields, and small industry. It is a rather disturbed area, far from natural. But I still managed to find and photograph all the above insects and more while being pulled along by four impatient dogs. So next week: a trip to a more natural area between Sonita in Santa Cruz County and Lochiel on the Mexican border, to check out blooming Desert Broom and Burrobrush (Chamisia), without dogs. Today we found a very heavy package in our PO Box. It contained the Mexico, Guatemala and Belize volume of 'The Dynastine Scarab Beetles' by Ratcliffe, Cave, and Cano. It's a comprehensive treatment of the 198 species of Dynastinae that occur in those countries, with English and Spanish keys, descriptions, images, distribution, and natural history. I received this and the two preceding volumes of the series about the other Central American countries for my contribution of several images to the Mexico volume. In the book, every species is depicted in form of a drawing, or in the last volume in form of a specimen photograph with a white background. But the description of every tribe begins with a full page image of a beetle in its natural surroundings. A couple of years ago, Brett Ratcliffe saw one of my images of Cyclocephale melanocephala in this blog and asked whether he could use it for the introduction of the tribe Cryptocephalini. So my little bug, sitting in the heart of a Datura flower made it into the book. I also got a list of other species to look for. Of course, my images are usually of Arizona specimens. But as we demonstrated on our Sonora excursion the beetle fauna of course ignores political boundaries and Arizona shares many, if not most of its species with northern Mexico. It's the tropical part of the country that's really different. So when the next monsoon season rolled in, I kept an eye out for the species on Brett's wish list and got a Coscinocephalus cribifrons in Miller Canyon (Huachuca Mountains) as the exemplar of the Pentodontini tribe. The Hemiphileurus illatus specimen that represents the tribe Phileurini was crawling around on the rocks of our drive way in the Tucson Mountains. I am very proud to have contributed something to this very thorough scientific book! I wished I had one like it for the other beetle families and subfamilies too. 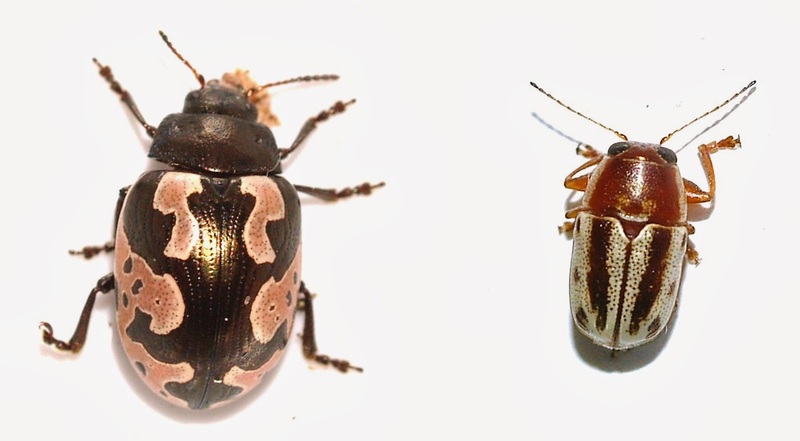 I am already studying the distribution patterns of beetles that we might encounter on the MABA expeditions next year. It will be very helpful to know which species to expect and where to look or how to attract them. I think I have found my new little paradise. On the last weekend in September I was invited to take part in a biological survey of Rancho las Avispas and Rancho Esmeralda in northern Sonora, Mexico. This was a project of MABA (Madrean Archipelago Biological Alliance). MABA is an organization concerned with protection of biodiversity and habitats on both sides of the political border between the US and Mexico. The result of our weekend trip made it very obvious how arbitrarily this border cuts through naturally cohesive areas. I counted hundreds of insect species, but none of them couldn't be found north of the border as well. This didn't make the excursion less interesting and beautiful. The two ranchos included three canyons with clear running water and beautiful rock formations, oak and ash trees, huge sycamores and lush under-growth. Tom Van Devender and Ana Lilia Reina kept a running count of plant species, they knew the area well, so they were only adding to what they had seen and collected before. They still brought back a very fat herbar strapped the roof of their car. The monsoon rain had been generous, but there were not as many blooming perennials as we had hoped for. So there were few hymenoptera species for Justin Schmidt, but enough Polistes wasps to understand the name of Rancho las Avispas. The air was positively abuzz with those guys and they even showed up at the lights at night. Our dragonfly and butterfly experts seemed happy though, and I forgot how many grasshoppers Bob Behrstock counted because he kept adding species continuously. Over the last years we made two exciting orthopteran discoveries in Arizona: Machaerocera mexicana (Mexican Blue-wing Grasshopper) and Aztecacris gloriosus (Atascosa Gem Grasshopper). The latter had been believed to be endemic to the mountains around Sycamore Canyon and Ruby Road. But at Rancho las Avispas we found the species in abundance. The Mexican Blue-winged GH preferred shady creek sides at Rancho Esmeralda, very similar to the habitat at Las Cienegas in Arizona. Archilestris magnificus and Systropus arizonicus. Robber flies and other Diptera were numerous and impressive. I found a mating pair of the largest one, Archilestris magnificus, and a bombyliid mimicked an Amophila wasp so closely that it had us all fooled at first. It was so active that I could only photograph it after it had been caught. : Systropus arizonicus. I found and photographed nearly 80 species of beetles and I could identify most of them with the help of my flickr collection of Arizona Beetles. 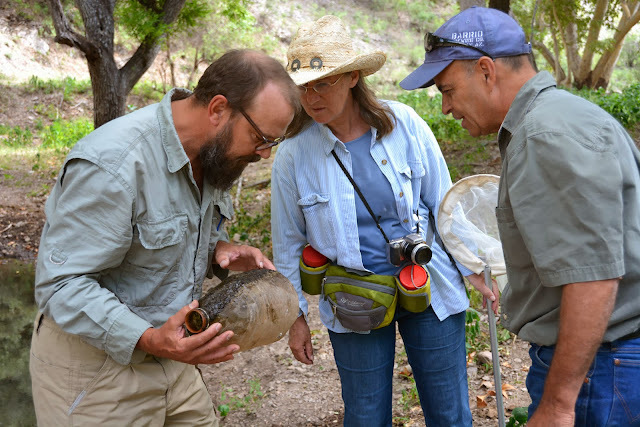 I was most excited about a rare Calligrapha and a little Pachybrachis that I hadn't seen before, but it turned out that Mike Quinn had found that species in Sycamore Canyon, Arizona, during our BugGuide gathering. That location is probably only 20 miles from Rancho Esmeralda as the crow flies. Close to 30 species of Hemiptera were found in the field and at the black light at night. The greatest surprise was the tiny Systelloderes in the family Enicocephalidae (Unique-headed Bugs). Rarely have I heard a more descriptive name. Because John Palting couldn't make this trip, I also did my best documenting the moths at my mercury vapor light. Many species were old acquaintances from Arizona. I was happy to finally get a good photograph of the beautiful Clio Tigermoth for my Tiger and Lichen Moth pages. The three canyons reminded me very much of Sycamore Canyon and Brown Canyon in the Baboquivaries of Arizona, but somehow these Sonoran Canyons seemed more accessible and yet at the same time more secluded and untouched. One reason for the feeling of remoteness was certainly that driving in, we met only some vaqueros on horseback and no Border Patrol vehicles or groups of smugglers. At the border in Arizona there is usually a lot of traffic of one or the other. So somehow it felt much friendlier and safer than in the canyons just north of the border. 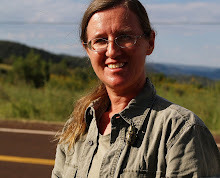 But it also meant that the steep gravel road wasn't improved for Border Patrol use, and after our first hike at las Avispas I found my van sadly tilted and one tire completely flat. That was quite a shock because I did not like at all the idea of driving back over the steep pass on my doughnut spare tire. But John Ochoa, our extremely generous host, only smiled and said they would find me a 15 in tire from one of their vehicles or just plug my tire...half an hour later the ranch foreman was back with my wheel, put it back on, and said he would watch for the next day if it held the pressure - it did. If I ever have car trouble again I hope it happens at a self sufficient Rancho with warm and helpful people like that! They cooked spicy food just as I like it and they had great loving dogs! Thank you so much to Tom Van Devender and Ana Lilia Reina who organized the trip, John Ochoa, our gracious host, John Palting who connected me to the MABA group, and the other dedicated, knowledgeable naturalists and biologists who made me immediately feel like a part of the group.